Apply for a loan and get an approval in one day! These prices are ex-showroom and, as such, are indicative only. Actual on-road price may vary. For further details, please contact your nearest TVS Motors dealership. Following Schedule Is For : 100000 to repay in 11 months. All calculations are based on EMI in Advance. The EMIs and other details listed herein are for indicative purposes only.For exact details, please contact us. Need more money to pay off your loan? We offer to sanction new loans against your current vehicle at a completely customised payment schedule where you choose the duration of the loan and can switch from a fixed-rate to an adjustable-rate. Have a loan, but need more? TVS Credit offers you Top-up Loans that help you do more than fulfil just one need. From home improvement to travel, a top-up loan covers all your personal needs at a much more attractive interest rate. EMI stands for ‘Equated Monthly Instalments’. The instalment comprises two components – the principal and the interest. EMIs provide you with the ease and benefit of paying back your loan in fixed monthly payments over a long period of time. What documents are required to change my communication/mailing address? Please mail a self-attested copy of any KYC document (as mentioned in the Eligibility and Documentation section) to helpdesk@tvscredit.com, or walk into any of our branches with your documents. Does TVS Credit offer any special schemes? We frequently offer special schemes – don’t miss out! To avail of our latest offers, get in touch with us. I am an existing customer. Can I apply for another loan? Yes. However, please note that the approval of your loan is subject to your credit score and fulfilment of eligibility criteria for the product. 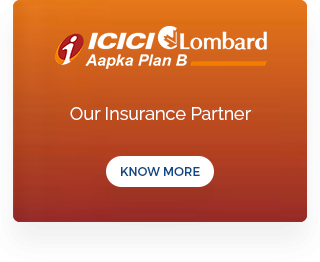 Will I be eligible for any special schemes after I have repaid my loan? Once you have cleared your loan without default, you may be eligible for special schemes. Do I have the option of prepaying my loan? Yes, this can be done as per the foreclosure terms mentioned in your loan agreement. Your loan will be processed within 24 to 48 hours depending upon the documents and verification requirement. Can the tenure and loan amount be changed after the loan amount has been disbursed? No, neither can be changed. Can I pay my instalment and other dues online? If yes, then how? Yes, you can pay your instalment and other dues online through our online EMI payment option which is located on the header of our website. To avail a two-wheeler loan, do I have to visit TVS Credit? 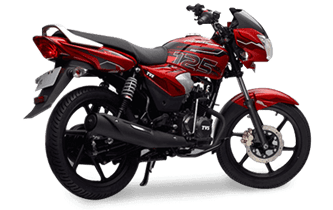 You need to visit a TVS Credit Two-Wheeler Dealership and ask for a TVS Credit representative, we will be happy to assist you with your loan requirement. You may also visit our website or social media pages and provide your contact details, post which our representative will get in touch with you shortly. Is there any security/collateral which needs to be offered for this loan? No. You only have to submit your KYC documents along with bank details for loan approval. Until the loan is repaid, the vehicle will be hypothecated to TVS Credit. You can borrow up to 95% of on-road price of the vehicle (subject to applicable terms and conditions). Exact percentage would depend upon your credit score and eligibility. We offer multiple tenure options ranging from 12 months to 48 months (subject to conditions). What will be the down payment/margin money? Down payment is a small initial amount that you will need to pay at vehicle dealership. It’s the difference between on-road price and loan amount sanctioned to you. 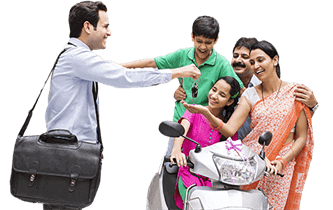 What all are the charges are applicable on two-wheeler loan? 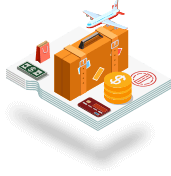 To ensure a smooth experience, we charge a nominal processing/ document fee and applicable stamp duty. You can get detailed information from our representatives at a TVS Credit Two Wheeler Dealership. What is the procedure to get NOC? 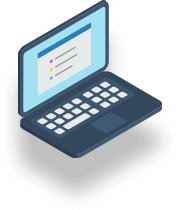 Once you have completed your loan repayment, we will process and close your loan, post which a physical copy of the NOC will be sent to your registered address. You may also contact our customer care number at 1800-425-3883 or write to us at helpdesk@tvscredit.com. When do I become eligible to get an NOC? How can I receive it? You can get your NOC once you’ve paid your entire loan amount and any corresponding dues applicable. Being an existing customer, can I apply for another loan? Yes, you can apply for another loan. Your spouse or any blood relative staying at your residence, can be a co-applicant. What will be done with the post-dated cheques if I request to change the mode of repayment/ account for my loan? The checks submitted will be defaced and retained. In case you wish to get back your cheques, get in touch with our customer care team or write to us at helpdesk@tvscredit.com.